There has been a lot of comments slinging around with regard to Colin Kaepernick’s decision to sit during the National Anthem. However this is much more serious. A hot dog shop in Kaepernick’s hometown of Turlock, CA, Main Street Footers, has taken a hot dog named in the quarterback’s honor off the menu. The CK7 included chili, coleslaw, Jalapenos and something called “Kaep Sauce.” It is still listed on their online menu, but it is no longer available in the store. It was $6.05 and was first released during the run to Super Bowl 47. One of the co-owners said people were on both sides of the fence on this topic, but they decided it was just easier to remove it from the menu, rather than deal with the controversy surrounding it. Just what exactly is Kaep sauce? So far its a secret. That could open up a whole different discussion here. Now that Colin has lost his name on the menu board its gotta be down hill from here on out. Creating the perfect hot dog starts with cooking, Steam then put on a grill just for a few seconds sears in the flavor. If you can’t steam then you can boil but wait until the water is boiling then put the hot dog in long enough to reach 140 degrees then put it in a frying pan with a little oil and cook it for about a minute. When it comes to the meat, there are two main types of hot dogs: beef and pork. While some may never have thought about the difference, I think beef will give you the best flavor, and you will want a 100% all beef hot dog. The first criteria for a proper bun should be the perfect fit. Hot dogs and buns go hand in hand and should fit as closely. The goal for the bun should be with every bite, you experience dog and bun as one, and not have bun left after the hot dog is gone. The bun is a carrier for the hot dog and therefore texture and flavor need to be kept in mind. A steamed bun is a perfect start. Then grill with butter until the edges are brown. “When the casing of the hot dog is snapped with the first bite, those juices are unleashed and there needs to be a bun there ready to collect and not get soggy and fall apart. Once you’ve got the perfect hot dog set in a perfect bun, plain ketchup will not cut it. Starting with a steamed and toasted bun, put grated cheddar cheese, inside the bun and then put the dog on top. It will soften and melt the cheese, then top it off with grilled onions, diced tomatoes, fresh crumbled bacon, a touch of avocado, zig zag some brown mustard on top. Finish with a sprinkle of celery salt. Twitter is a great tool to use in your mobile hot dog business. It lets customers know where you are and best of all its free! Using Twitter also allows you to build relationships with your customers. Here are some simple practices you can use to improve your following on Twitter and in your business. To build customer loyalty, strike up conversations with your followers. You can take requests for special orders and deliveries. While you are at it ask followers what their favorite locations are around in your local area. If you get a good review about your food on Twitter, retweet the comment for more exposure. Just posting tweets without some personality will go unnoticed. Try to make people laugh with witty comments or humor. It lets your customers know there’s a real person behind the business, and they’re likely to keep an eye on the page if they’re entertained. Twitter is a tool you can use to drive people to your location, but you can also use it to drive people to your website and blog. Businesses can use Twitter to direct followers to their websites to learn more about the company and to increase sales if they have an e-commerce site like Bombdiggity Hot Dogs. Your number of followers isn’t always a measure of your success on Twitter. When you first start doing this only a fraction of your customers will be on Twitter. So pay attention to how often people tell their friends and co-workers about your location. It’s important to look at how your Twitter strategy is impacting day-to-day operations. Announcing promotions and contests through Twitter encourages repeat business. Try a 50% off deal for the first 3 customers who saw you on Twitter. This keeps them tuned in to your tweets and adds business for you. As in earlier posts I said you need to get everything legal. It’s not an easy task to do but it is the most important step. It has been quite awhile since my last post on the Hot Dog Business. In defense I do run a successful Hot Dog Catering business and do not sell books on how to do so. My hot dog business takes up a lot off my time. Keep that in mind when you get the urge to start this kind of business. Also I want to add that we are still working on the interviews at TrapperSherwood.com of owners of successful hot dog businesses. Those people are busy also and it’s hard to schedule time with them, but it is coming together. Ok Location, here are a couple points from experience. You can set your cart out in front of a Lowes or Home Depot. You do have to pay rent to a third party. They will make sure you have the correct permits, license, and insurance. (the legal stuff) Different states and cities have different regulations. I had to petition my local city to allow my cart at one of the above places. I would check to see if there is enough traffic at the location you have in mind. I’m sure Home Depot and Lowes do not have the traffic they had 5 years ago when the economy was booming. Your specific area may be different. You can also go your local hardware store and ask if they mind if you have your cart out there. Offer the employees a lunch deal not offered to the public. Varity is a key here. You will loose customers if you don’t change things up a bit. Maybe the local court house is a good location for you. Check and see if that is a possibility. What I am trying to say is get in the car drive around to where you think you might want to put your cart and start counting the traffic. This will take some time, but its better than spending money on an unknown. One last idea, start a Twitter account and start following all the mobile food businesses in your area. That means follow them on Twitter and physically follow them to see where they go and what happens. I know a food truck that was new in the business and did exactly that. He is very successful now. Next topic: how to make Twitter work for your business. Ok so if you have been following along I started a series on how to start a hot dog biz. We we have been pretty busy at Bombdiggity Hot Dogs so I apologize for not blogging sooner. To pick up where I left off, we have been working on the interviews and will be available soon. I will post the links in this blog. Let’s go back a step to the planning stage. You will need to check with your local heath dept. BEFORE you buy a hot dog-cart. I have seen numerous ads claiming that “Our cart will pass the toughest health dept. regulations.” My business is in California, a lot of what I see on the net will NOT pass code here in Ca. In fact some counties will not allow a steamer cart but will a griddle cart. Don’t ask me why it’s just the way it is. This one step will save you money and a whole lot of grief. Get your list of what is needed from the health dept. and then go to a reputable builder with the specs. Check out your local city laws to see if food carts are legal. A lot of cities will not allow mobile food carts. From experience I can tell you that the county health dept. does not talk to the local city. So what may be legal in the county is not in the city or vice versa. Ok so now you have your cart and all is legal what about insurance? You need to buy some liability insurance to cover you in case someone says they ate your food and got sick. No insurance means you could lose a lot! Liability insurance is not expensive for one or two carts. You can probably pay for it on a monthly installment program also. Next post will be on the food aspect: What do you start with and where to get it. Hot Dog Cart Builder Fails To Make Good. More than a dozen consumers have been left out in the cold when they spent a few thousand dollars to order hot dog carts on eBay and got nothing in return. The company allegedly offered two carts on eBay for $1,500 and $4,300, but never delivered them, says Tom Gallagher, president of the local BBB. One complaint filed this month says a buyer sent the seller money through a wire transfer and was told the cart would arrive in about a month. It never arrived, but a contract did — saying the buyer had five days after date of purchase to cancel the contract. Unfortunately, it arrived a month too late. After almost two months of being told that the cart was lost, that there was a new delivery system, that things were crazy because of the holidays AND that the cart would arrive next week — still no cart. And the owner refuses to return the money. Gallagher says the BBB plans to contact state and federal authorities. If you’re planning to make a big purchase from an online auction, officials usually recommend an escrow service, particularly for items over $500. The service receives the item from the seller before sending the payment. EBay recommends Escrow.com, and warns consumers of many fraudulent escrow companies — so if a seller suggests another company, investigate that company first. In addition, avoid paying for online auction purchases via wire transfers, which carry few to no fraud provisions compared to credit cards. I remember as a kid mowing lawns, raking leaves, or shoveling snow to earn a buck. I thought that spirit had long faded away. You don’t see kids doing those kind of things for money anymore. But today I read about a 10-year-old boy who is in the process of starting his own hot dog business! 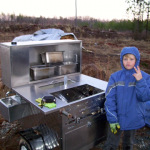 Young Parker from Virginia with the help of his dad has purchased his first hot dog-cart from money he saved up. Parker decided to go into the hot dog business as a way of paying for college. 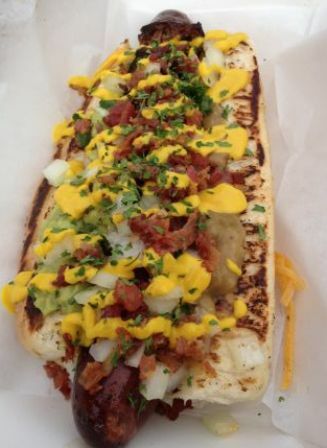 Right now he is awaiting permit approval, and will be out there selling hot dogs soon. Parker is also has a website for Peadawgs. My hats off to Parker and his parents for instilling in him the work ethic and entrepreneurial spirit to make this happen. A couple of months ago I wrote of a guy who had his Hot Dog Cart stolen, Frank Martucci owner of Fred’s Franks in Orangeburg, N.Y. Thugs stole his only means of supporting his family; his hot dog-cart. In the update Mr. Martucci received a loaner cart from a business owner in his local community. Today Fred Martucci celebrates the grand reopening of Fred’s Franks on Route 303, and the community who supported him through the last few difficult months. Fred’s insurance company replaced his stolen trailer with a new one. Fred’s first hot dog-cart was 10 foot by 7 foot. His new trailer is 2 foot longer and has an extra umbrella to shield customers from the elements. The new shade of yellow makes him visible from a few hundred feet in any direction. “People tell me it just pops out at them from a distance,” Martucci said. Fred’s Franks has never had a grand opening so today is his grand re-opening. 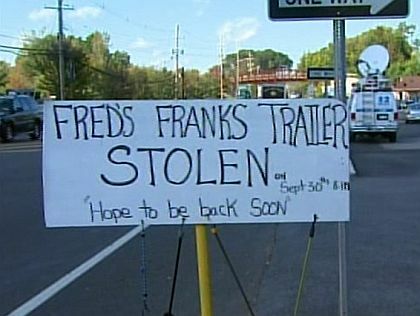 Police are still looking for the criminals who stole the original Fred Franks hot dog-cart back in september, but at least Fred is back to his location and selling hot dogs. What a great ending and just in time for Christmas. We do Hot dog Catering in Southern California. Look us up sometime.